Two new types of drinking establishments - improved pubs and road houses - emerged in interwar Britain. Though distinctively different, the fact that they each flourished in the 1930s would create considerable confusion for later commentators. Even architectural historians like Clive Aslet and Robert Elwall wrote as if the terms could be used interchangeably. i This confusion arose for several reasons. Both served alcohol, and regarded the new mobile motorists as an important part of their clientele. Because many improved pubs were built on newlyconstructed trunk roads and by-passes, it was easy to assume that such places were, as houses along the road, road houses. Most interwar Britons, however, at least those who drank alcohol on licensed premises, knew better, and would not have mistaken either of them. Brewers began building improved pubs immediately following World War I. As I explain in my forthcoming book, Pubs and Progressives: Reinventing the Public House in England, 1896-1960, ii certain features made them easily distinguishable from pre-war beerhouses and pubs: vast size, absence of advertisements pro-claiming the sale of specific beers, few entrances, opaque windows and (where space permitted) spacious pullups and gardens. 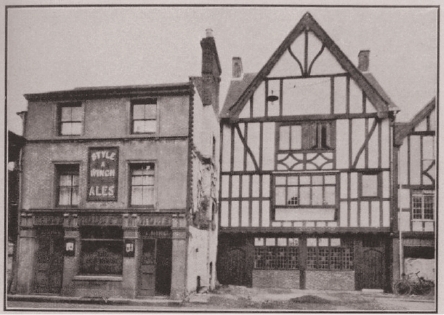 In planning the construction of improved pubs, brewers employed the most expensive building materials and, for the first time, the country's leading architects as designers. Basil Oliver, E.B. Musmen and Joseph Hill were but three of the most distinguished architects who undertook numerous commissions for Greene, King & Sons, Benskins' Watford Brewery and Hodgson's Kingston Brewery respectively. They helped make Tudor architecture popular in the 1920s and Georgian in the 1930s. Musman experimented with a third style in the 30s, Moderne, achieving considerable distinction with the Nag's Head (Bishop's Stortford) and the Comet (Hatfield). So did Oliver Hill, who designed the Prospect Inn (Minster, Kent), but for Group Services, not for brewers. Pubs with a ‘modern cubist and futurist design’ won few converts in ‘the trade,’ the name collectively used for all members of the brewery industry since the 1890s. Thus, one brewer denounced this style as ‘dirty concrete monstrosities without anything to redeem their ugliness’. iii Likewise, Lord Brocket, Chairman of Peter Walker, bluntly castigated this style as ‘appalling’. 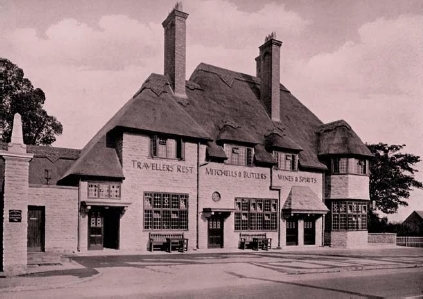 iv Interestingly enough, this distaste had not stood in the way of progress, as Peter Walker's reconstruction of the Queen's Arms (Aintree) in the Moderne style in 1930 had attested. Before and after rebuilding, The Old House at Home, Maidstone, completed by Barclays in 1932. The Tudorbethan style still remained popular into the 1930s. Brewers often preferred building on a nearby site so as to disrupt business as little as possible. Inside, the Victorian vogues since mid-century for numerous compartments, ‘gin-palace plate glass windows’ and embossed or back-painted mirrors abruptly ended, and lengthy bar counters were shortened (but only in the south). vi It was the addition of specific function rooms, however, that most differentiated pre- from post-war pubs. Customers got dining rooms and a better quality cuisine. At the most refined, the food rivalled that served in London's West End, scarcely surprising given brewers' penchant for poaching the capital's leading chefs. For the Golden Lion (Hillingdon, 1938), Fuller, Smith & Turner hired a caterer experienced at the Dorchester, Mayfair and Grosvernor House, three exclusive West End hotels. Whitbread, too, installed a veteran caterer formerly employed at Sovrani's ‘Blue Train’ Restaurant (Mayfair), when opening the Hendon Way (Hendon, 1934); and Ushers reopened its reconstructed New County Hotel (Gloucester, pre-1938) with a manager and chef previously at London's Savoy and Easton Hotels. Such pubs began appearing in the early 1930s, customarily cost staggering sums (£20,000 - £25,000 or more), and occupied strategic road sites to draw motorists. vii To cater for private functions, an assembly room, a separate, enclosed area designed to accommodate large groups, began appearing in new pubs, especially in suburban Birmingham. Both dining and assembly rooms doubled later in the evening as dance rooms. Another new space in improved pubs was the tea room, which proved popular with motorists unable to obtain alcoholic refreshment during the lengthy nonlicensed afternoons. Traveller's Rest Improved Public House, Birmingham before rebuilding. Traveller's Rest Improved Public House, Birmingham after rebuilding. 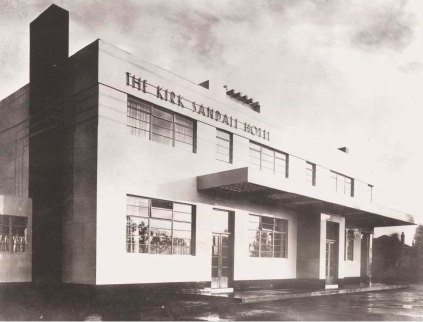 The Kirk Sandall Hotel, near Doncaster, was built in 1934 by Pilkington Brothers, St. Helens glass manufacturers, as a showcase for the firm's product. Wherever possible the company employed glass as a building material. The Barn's colourful history epitomized the development of roadhouses. Capital for their construction generally came outside the matrix of industries involved with alcohol production. Liquor sales, indeed, were not viewed as the most critical attraction: certainly some roadhouses, like the Barn, eventually acquired a liquor licence, but many others never held one. Unusual, even exotic, entertainment enticed the public, running the gamut from the Barn's exercise facilities to kennels for pedigree dogs, cages of white rabbits and nature sites such as caves with kaleidoscopic colours. To exploit a pre-existing site while simultaneously economizing on construction costs, entrepreneurs turned to renovating derelict water mills. xviii Exquisite food beckoned, as did dancing on flood-lit floors to live music well into the late evening hours. Roadhouse promoters wanted to project an image of luxury as much as comfort in a recreational centre replete with the most modern technology and expensive conveniences, especially in the accommodation rooms. For all these reasons, the style chosen most often was the prevailing 1930s architecture. Flat roofs, barren walls, unadorned surfaces, pronounced lines, metal-framed horizontal windows, curved shapes, streamlined counter-tops and chrome characterized the new Moderne style. Such features provided the idea environment for cocktail bars and lounges, where the motoring elite enjoyed the most fashionable cocktails. With the advent of the Second World War, the growing popularity of improved pubs and roadhouses ended abruptly. Though new examples of both appeared in the 1950s once the Government lifted its building moratorium, the golden age of leisure aimed at wealthy motorists was over. Of the two different types of recreational premises, the ‘roadhouse’ as a term ironically survived in popular memory far better than the improved public house. In this context, numbers were meaningless: probably no more than 200 bona fide roadhouses appeared, whereas brewers completed building almost 6000 improved pubs. xxi Image, as in so many things, proved more enduring than substance. The slightly naughty perception of the 1930s roadhouse resonated far better in the popular consciousness than the staid improved public house, a quickly forgotten nondescript term. Though both were quite distinct, the public came to associate the drinking of the propertied classes during the entire decade with a specific iconic image. Risqué, pioneering novel types of leisure activities and class specific, the roadhouse evoked slightly wicked leisure outings by the propertied classes which through drinking, dining and dancing defied the reality of the dismal 1930s. Clive Aslet, ‘Beer and Skittles in the Improved Public House,’ Thirties Society Journal 4 (1984): 2-9. Another architectural historian described the roadhouse as ‘a large pub with limited hotel accommodation’ (Robert Elwall, Bricks and Beer: English Pub Architecture, 1830-1939 (London: British Architectural Library, 1983), p. 42). It will be published by Northern Illinois University Press in spring, 2005. Things that Affect Us 18 (May, 1953): 10. This was the staff magazine of Vaux & Company. Brewing Trade Review, March, 1938. Walker-Cain Photographs, Liverpool Record Office; Bootle Times Supplement, 21 Nov. 1935. Mark Girouard, Victorian Pubs (London: Studio Vista, 1975), pp. 57-73, 140-42. Clive Aslet, ‘Refuelling the Body, the Soul and the Morris Road Houses of the 1920s and 1930s,’ Marcus Binney and Emma Milne (eds. ), Time Gentlemen Please! (London: SAVE Britain's Heritage and CAMRA, 1983), p. 21; M.G. McMinnies, Signpost to the Road Houses, Country Clubs and Better and Brighter Inns and Hotels of England (London: Simpkin Marshall, 1935), p. 141, and 3rd ed. (1937), p. 176; Caterer and Hotel-Keeper, 4 and 11 Oct. 1935, 30 Oct. 1936, and 29 Jan. 1937; Basil Oliver, ‘English Inns,’ Journal of the Royal Institute of British Architects 39 (1932): 556; Pennant, Apr. 1932, p. 14, Apr. 1933, p. 44, and 4 (Christmas, 1936), p. 7. David W. Gutzke, ‘Gender, Class and Public Drinking in Britain during the First World War,’ Jack S. Blocker, Jr. and Cheryl Krasnick Warsh (eds. ), The Changing Face of Drink: Substance, Imagery, and Behaviour (Ottawa: Histoire Sociale/Social History, 1997), pp. 311- 12. ‘The Ideal House,’ House of Whitbread 2 (Jan. 1926): 44. Basil Oliver, The Modern Public House (London: Fellowship of Freedom and Reform, 1934), p. 23. Argosy, Sept. 1971, p. 8. Gutzke, Pubs and Progressives, App. 3. Roadhouses have attracted little historical interest. The best introduction is Peter Thorold's The Motoring Age: The Automobile and Britain, 1896-1939 (London: Profile Books, 2003), pp. 138-41, 153-54. I plan to devote a chapter to the subject in Cultures of Drinking Since 1900, the book I am writing for Manchester University Press in its Studies in Popular Culture Series. Caterer and Hotel-Keeper, 22 July 1938. Caterer and Hotel-Keeper, 3 May and 19 July 1935. Caterer and Hotel-Keeper, 12 June 1936. McMinnies, Signpost (1935 ed. ), pp. 140- 41; Caterer and Hotel-Keeper, 5 Aug. 1933; Anchor Magazine 17 (July, 1937): 151-52. George Long, English Inns and Road- Houses (London: T.W. Laurie, 1937), pp. 181- 82. 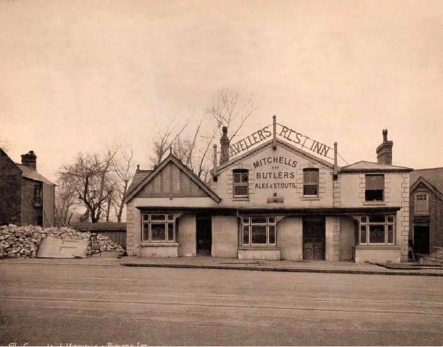 McMinnies, Signpost: (1935), p. 173; 3rd. ed. (1937), p. 335. McMinnies, Signpost, 4th ed. (1938), p. 153. For an examination of the building projects, see Gutzke, Pubs and Progressives: Reinventing the Public House in England, 1896-1960 (forthcoming, Northern Illinois University Press), Ch. 10.